It adopts hierarchical (100 levels) temp-adjusting system, just click "+" and "-" to set hierarchical level for realizing accurate temp controlling. Equipped with six 500W far-infrared heating tubes and three switches. Each switch controls 2 tubes whose power is 1000W. Temperature can be adjusted in 3 stages. Easy operation and power-saving..
High heating efficiency. Six stainless steel heating tubes (500W of each) make the temp increase quickly. The aluminum plate in the back of the tube can reflect heat, which means that the screen can be dried evenly. Foundation is paralleled with heating box. Stable, space-saving and safer. All chroming-steel structure. Sturdy and artistic design with powder coated housing to prevent rust. Height is adjustable. Equipped with four universal wheels, easy to move. Full set of installing tool equipped, easy to assemble. 9. Equipped with full set installation tools. 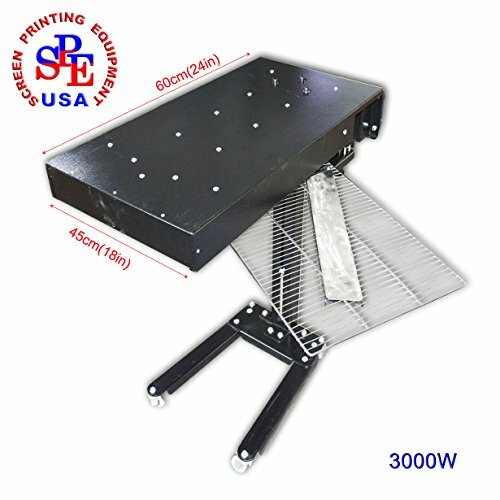 110V Flash Dryer for Screen Printing Flash Cure for Screen Printing 18X 24Inch Silk Screen Printing 3000W for T-shirt Curing Ink Intelligent 3-Stage Temperature Adjustable Flash Dryer. NOTE:DON'T TOUCH THE NETWORK WITH HANDS WHEN WORKING. As a equipment in screen printing, flash dryer play an important role. Based on the need of market and development of screen printing, this new flash dryer is designed specially. It is used to dry the screen. Compared with traditional dryer, it not only keeps the former advantages but also possess some new merits. 1) If the temp it shows is higher than your need, just click "-" to lower the digital reading appropriately; 2) If the temp it shows is lower than your demand, just click "+" to increase the digital reading appropriately.